Useful information about rubbish removal for your area. It’s important in Auckland, as the largest city in New Zealand, that we find ways to not only safely dispose of rubbish, but also reduce our dependence on landfill altogether, by a combination of sustainable production methods, using recyclable materials, reducing unnecessary waste, rehoming items that still have some life in them and putting our rubbish to good use. There are 1001 ways to reduce, reuse and recycle. Some are ingenious, and some are just common sense. The Auckland Council have launched a plan to reduce our city’s waste to zero by 2040. This means no more rubbish going into landfills. An ambitious goal, but one that everyone can have a hand in realising. But first it just takes a bit of understanding, and a bit of know-how, which we’re here to help with. We’ve compiled a list useful of links (below) to council information pages and organisations recommended by the council. 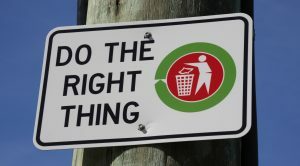 These include advice on how to dispose of different types of rubbish and recyclables safely, cheaply and greenly; what the council is doing to implement environmentally-friendly waste management practices; statistics on rubbish and recycling in New Zealand; what services are available to the public; how individuals, organisations and commercial businesses can get involved in reducing rubbish; where to recycle different types of waste. Collections in your area. If you’ve just moved house, you’ll want to know what days and how often rubbish and recycling collections take place in your area. You can go here to type in your address to find out your collection day. What can and can’t go into your kerbside bins. This page provides a list of what should go into your rubbish bin and what kinds of things CAN’T be put into general rubbish. Here’s a list of what can go in your recycling bin and what can‘t. Council waste service for small businesses. Click here for information about the waste services the Auckland Council provides to small businesses in different parts of Auckland. Auckland transfer stations. Here’s a list of the transfer stations (dumps) in Auckland where you can take rubbish to be landfilled and in some cases recycled or sold. There is a charge by weight for taking rubbish. You should check opening hours before you go. Also check the list of accepted items as not all transfer stations accept all items, e.g. hazardous materials or scrap metal. Inorganic collections have changed. Instead of everyone piling their inorganic rubbish on the street, where it sits for up to a week, there is now an annual council service that requires you to book a pick-up. There is no charge for this, it’s still rates funded, but you do have to make a booking, and the items will be picked up from your property, rather than from the street outside. More info here. New bin service for Waitakere explained. ‘Pay-as-you-throw bins’ have replaced prepaid bags in Waitakere. These use prepaid tags, and you put it out when it’s full, so if you don’t create a lot of rubbish, you don’t have to pay for an empty bin. This service is also being rolled out on the North Shore in 2018. All your questions answered here. New Manukau bins. The former Manukau City Council area has switched from bags to bins. All you need to know here, including how to request a larger bin. New food waste bins are being trialled in Auckland in 2018, starting with Papakura. This website tells you all you need to know about the new bin service, including frequently asked questions. Auckland Council ‘Zero Waste’ by 2040. Launched in 2012, the Auckland Council has an ambitious plan to reduce landfilled waste by 30% by 2020 and 60% by 2030 and 100% (no waste to landfill) by 2040. The Waste Minimisation Plan can be read in full here. The council is offering grants for ‘zero-waste’ initiatives to people and groups with “great ideas”. Here is some more information about how to apply for grants, and some examples of grants already issued. Food waste – how to reduce it and why it matters. Reduce waste from your business. Here is a useful link providing information on how conduct a waste audit for your business, lists of resources for recycling and sharing materials, advice on how to reduce waste and save money. Sustainability advice for businesses – information and learning resources. Renew.org.nz is a not-for-profit waste exchange operating in the Auckland region, that links up businesses that have surplus materials, industrial by products, or waste with businesses or people that can use them. This site focuses on reducing the amount of building and demolition waste generated at commercial construction and demolition sites, and provides some suggestions on how to do it. Charities such as the Salvation Army, the Women’s Refuge (especially clothing and bedding in good condition), your local hospice shop, or community recycling centres, all welcome pre-loved items in good condition. Especially if something is too good to throw away, but you don’t need it anymore, consider donating it to charities that redistribute personal and household items to those in need. See also our page on donating items to charity. Community recycling centres. These accept items that can be reused, repurposed or recycled, such as furniture, whiteware, books, building materials, household items. These centres have shops where they sell items. Some can also accept garden waste. There are several of these centres around Auckland – here’s a list of locations. Arts and craft materials. Donate to arts and DIY projects by dropping off your surplus materials to WARC (West Auckland Resource Centre), which provides recycled materials to educational and community groups. If you’re on the North Shore, you can donate similar items to the North Shore Resource Centre. Their website lists the kinds of items that are accepted. Report illegal rubbish dumping and littering to the council here. Report pollution to the council here. The council also recommends an option for recycling children’s car seats. Electronic rubbish. Some companies provide an end-of-life recycling service – ask about this next time you buy an electronic device. Mobile phones can be recycled. Scrap metal. Rather than paying to have it removed, you can actually get money for scrap metal from various scrap metal dealers around Auckland. The price depends on weight and also other materials that need to be separated. Some of the council’s transfer stations take scrap metal for recycling, but you need to check before you go. If your local dump doesn’t take scrap metal, commercial scrap dealers will take things like ovens, sheet metal offcuts, old pipes, wire, car parts (not tyres) – anything that’s got a significant proportion of metal. Most types of metal are accepted. Copper and aluminium are particularly valuable and viable for recycling. If you need a pick-up service, call us on 0800 DUMP ME to arrange for your scrap metal to be removed and recycled. Hazardous waste. Hazardous materials are those that are not suitable for kerbside collection because they are either flammable, toxic, explosive, corrosive or radioactive. Common examples include chemicals, paint, batteries, bulbs, gas cylinders. You can usually take these to your nearest transfer station (rubbish dump) to be disposed of appropriately. Contact the transfer station first to check what kinds of hazardous materials they accept. Or give us a call on 0800 DUMP Me for advice on how best to dispose of particular items, or to arrange them to be picked up. This page contains council information about waterways and what is being done to protect them. Storm water information is available here.